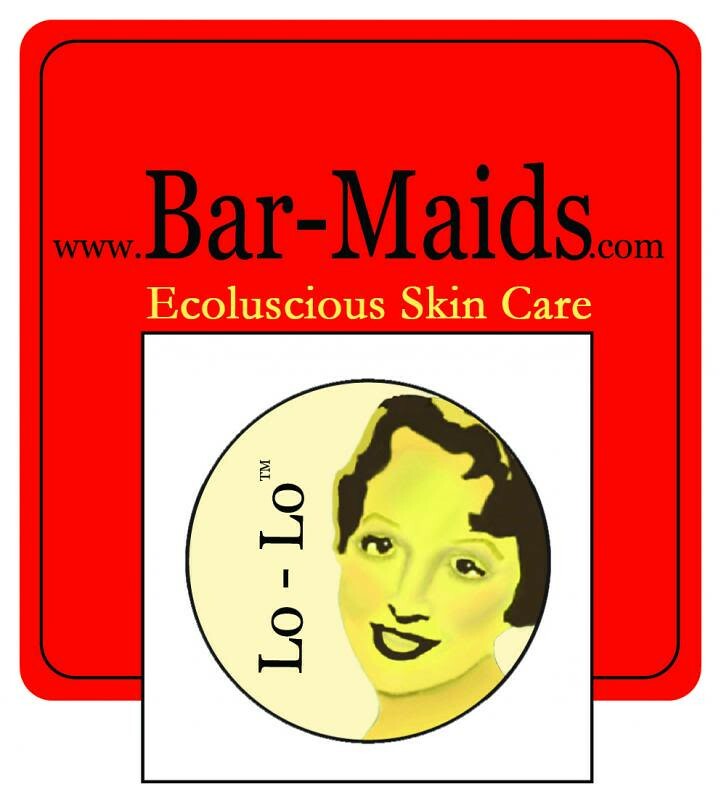 Bar-Maids doesn’t create average moisturizer, it's an eco-luscious moisturizer to fit your lifestyle. Bar-Maids offers a wide variety of scents so you can find one just right for you, and if scent isn't your thing then Buck Naked is your go to. If your skin needs a lot of love and moisture then the Body Bar is your product. If you need ecolucious love and moisture on the go or to tuck in small spaces, there is nothing better to pop into your favorite knitting bag than a Lo-Lo To-Go. If you are constantly on your trotters, or like to show off your piggies, O'For Feets Sake is going to make those puppies feel brand new. So brand new you'll be running a marathon in no time. Feed your delicate facial skin with the enriched Face Pudding, pun intended. Use daily for hydration, or nightly for skin you've only dreamed of. If you appreciate products handcrafted with precision and love from a stellar little company, then visit www.Bar-Maids.com for a full list of products and customer reviews. Infinite Twist produces unique and luxurious hand-spun yarns that are crafted in a socially responsible way. Spun from hand-painted roving and hand-blended batts, our hand-spun yarns are a tactile delight for knitters. We also offer project kits that take the guess-work out of yarn and color selection, and hand-dyed mill-spun yarns in striking semi-solid colors. 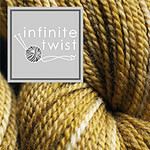 Find out more by visiting infinitetwist.com, or find us on Ravelry and Instagram as infinitetwist. Sign up for our newsletter for a free knitting pattern every month, and don’t forget to use offer code “knitmore”! We have a quick, one minute health update. Gigi is knitting a preemie hat a day for #onadayinmay. Jasmin is gearing up for the Stash Dash and trash talking CommuterJen, Stitchmistress and Emily Knitting Butterflies. Stash Dash is hosted by the brilliant Knit Girllls. Jasmin unearthed a bin of UFO's for Stash Dash. Jasmin does a summary of the Kapuzin hoodie, in Lisa Sousa's Hardtwist, in the St Louis Blues colorway. She is nearly ready to sew on the grosgrain ribbon and add buttons. Gigi is saving the bind-off of the Boneyard Shawl in the Urban Sunrise colorway by Abstract Fiber. for the Stash Dash. She mentions Susan B. Anderson's videocast. Jasmin is working on the Rainbow Dots cowl out of Canon Hand Dyes mini skeins, stored in her Erin Lane Two-fer bag. She is enjoying the fair isle technique tremendously. Gigi is knitting tube socks for Genevieve out of My First Regia, which comes in 25 g balls. Jasmin is working on the Viajante #Behmalong, out of Miss Babs Kilimanjaro in the Metro colorway. And she discovered a beaded edge for it, which she linked on her project page. Gigi is enjoying the Braidsmaid #Behmalong tremendously. Jasmin is also on a Martina kick, and she has started the Fractal Danger #Behmalong in the Danger colorway. Jasmin mentions the Lolo House Special Box, and how much she likes everything out of it. 6/6/2015: Fleeces, Food and Fun at the Retzlaff Winery, and we list the things to bring, and mention Morro Fleece Works. 6/19-21/2015: Black Sheep Gathering 2015, in Eugene, Oregon June 19-21. Stash Dash Runs from May 22 to August 14. We have a winner this week! Fishknits Strong heart base in the Cool Ten colorway. We are co-hosting the Countdown to Outlander Knitalong on instagram, #countdowntooutlander, #kiltmenowKAL. This has to be creatively related to the Outlander series. Getting help from pocket Jamie is encouraged. This is an instagram contest, so please make sure to use the appropriate hashtags. This is being co-hosted by Maria from Subway Knits, CC from Geeky Girls Knit, and Kristin from YarnGasm. two braids of fiber and two skeins of yarn from Gourmet Stash in the colorways "Time Traveler" and "Waterweed". A skein of yarn from Katie's Creations (Mint Rain), Scottish Highland colorway in the Tough Sock base, in a very springy Highland green color. A skein of the"Je suis prest" colorway, from Gingertwist Studio in Edinburgh, and the new shawl book by Claire Devine "Head to Toe"
A Highland Thistle bag, by Little Skein in the Big Wool. Newest Prize: a project bag from the Caithness Craft Collective out of an authentic weathered Fraser tartan. We talk about the podcast by Ron Moore about Outlander, and Terry Dresbach's podcast about costuming on Outlander. Gigi is cruising along on the Braidsmaid, and having so much fun with it, that she is cruising right past the cables regularly. This week we purloin #memademay from Isabelle of the Fluffy Fibers podcast and A Playful Day. 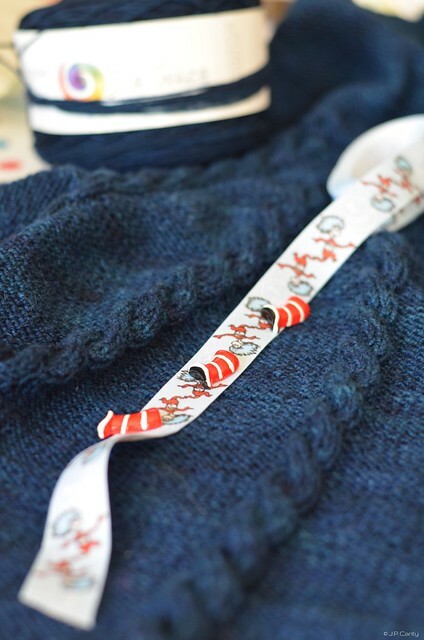 Jasmin mentions Amy Herzog's Knit Wear Love , and her Craftsy class. Let us know about how you deal with making things you can wear.